Nothing about the birth of Jesus was normal. How can human logic explain the virgin birth, the precise fulfillment of Old Testament prophecies and the angels' joyful announcement to some poor shepherds? How can science explain the mysterious "star" over Bethlehem that drew scholarly Magi from the East to a temporary "house" for a heavenly King? Apart from a Christian perspective, it makes no earthly sense! God's ways continue to amaze me! The strangest and most inexplicable events are part of His wise, sovereign plan. And if I don't understand, He doesn't owe me an explanation. He just calls me to trust and follow Him. That's what the Magi  chose to do! God had obviously prepared their hearts. In their distant land, they were given "sight" to see the miraculous light hovering over the manger of Jesus! It may have taken them a year or more to reach their goal, but for those who serve Him, such timing is simply part of God's plan. As David wrote in Psalm 31:15, "My times are in Your hand!" So, who were those "wise men" or "Magi" from the East? The Bible doesn't give us specific answers, but their response to God's guiding light demonstrates their faith in our God. And the gifts they chose for the precious King point to positions of wealth and influence. They were probably among the elite scholars and astronomers in the Parthian empire (247 BC – 224 AD). At the time, it included both Media and Persia. There, these "wise men" would have studied the Old Testament prophecies as well as other ancient historical documents. Jewish scribes and scholars had brought those treasured Scriptures to Babylon during the exile that followed Israel's slide into idolatry about six centuries earlier. By this time, the wisdom and goodness of God had already been demonstrated among His exiled people -- through the lives of Ruth, Nehemiah, Daniel and many others. Since Biblical records were treasured in those days, they would have been carefully preserved even through the turmoil of wars and changing national borders. Therefore, the God of Israel was no stranger to Persian scholars at the momentous time when Christ was born. Today, most Christians know that God communicated His long-awaited news to the Magi in the East through a bright supernatural light that would lead them to a small town in the West. (In fact, they may have been the only people who saw it.) What a joyful moment! God's silent message had truly reached their hearts! Soon afterwards they began their journey to worship their King. Were they surprised when no one could answer their question? Did they wonder why the people in Jerusalem were so ignorant of this long-expected event? Why would such a King not be honored in His own homeland? We could ask similar questions about America. Why do so few delight in God's Word? Why has our government banned the Ten Commandments and other vital truths from our schools and public places? Why does it promote immorality and censor Christianity? Why do people despise His moral guidelines and malign His name? But we shouldn't be surprised. Human nature -- "under the sway of the evil one" (1 John 5:19) -- continues to tempt, distract and corrupt people in the West as well as in contemporary Israel. Yet, through the ages, that spiritual war has raged most fiercely in the latter. Two thousand years ago, most Israelites were blind to the glorious birth of the newborn King. The Bible only mentions a few celebrants: some poor shepherds out in the field and Anna and Simeon, two old, expectant believers. Apparently, the rest of Jerusalem didn't know or care! That is, except for the paranoid and depraved King Herod. Born in Edom (an unfriendly nation south of Israel), he had been appointed king by the Roman rulers. To him, the Magi's quest was shocking news! Read that again! Some believe that the starry light was a comet rather than a star. But comets are not equipped with the intelligence needed to lead the way to Bethlehem and then stop directly above the right house! This had to be an act of God, not nature! Nehemiah, who was exiled along with Daniel and others, describes the same event centuries later and adds this phrase: "...to give them light on the road which they should travel." (9:12) Nothing is impossible for our wonderful King! "And when they had come into the house, they saw the young Child with Mary His mother, and fell down and worshiped Him. ...they presented gifts to Him: gold, frankincense, and myrrh. Then, being divinely warned in a dream that they should not return to Herod, they departed for their own country another way. The young family's obeyed God and fled to Egypt -- a journey that may well have been financed through the valuable gifts from the Magi. The sovereign God who directed their paths would also meet all their needs! Their flight was followed by was Herod's murderous attacks on little children. That tragic bloodbath illustrates the heartlessness of the demonic forces behind the visible world. Its cruelty (but not its numbers) matches Hitler's mass killing of Jews in Europe and Stalin's unthinkable cruelties in the Soviet Union. It's comparable to the deadly violence raging in much of the Middle East and in other parts of the world. As the chart shows, when people trust God and follow His guidelines, nations are blessed with His presence and protection. When they become proud and prosperous, forget His guidelines and embrace corruption, He withdraws His protection and allows enemy forces to bring destruction. 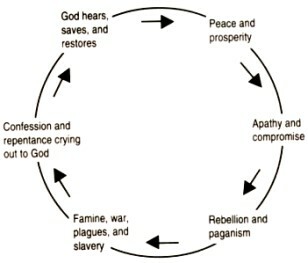 The violent downside of this historical cycle is bringing hopelessness and despair to millions in the post-Christian West. We shouldn't be surprised. It's no secret that references to our God are banned from America's schools and public places. The former school and community celebration that brought believers together in thanksgiving and joy have been either censored, maligned or transformed into a mockery of God's Word. All too often, Jesus is either forgotten or maligned. Let's look again at the unseen forces of evil. If we don't understand the nature of our spiritual enemy, we won't be prepared to "stand against the wiles of the devil" and follow our Lord! The "male Child," of course, was Jesus, our King! He would face Satan's full onslaught about thirty years later, when He hung on the cross, paying an excruciating price for our sins that we can't even fathom. The "woman" in this story is the mother of Jesus. But she may also represent all the Jewish believers who have put their faith in Christ. That group would include His first century disciples and apostles, most of whom faced torturous death for sharing the gospel. It would also include the Jews who were "born again" by His Spirit during the first Pentecost (Acts 2). They helped spread His gospel far and wide in the years that followed. Though I don't share that special Jewish heritage, I am one with all who love and follow our King. Like the faithful Magi, we all share a common desire to worship His majesty, obey His Word, follow His guidance, spread His Truth and share His love with all He puts in our path. Those pleasures may not be the delights the world seeks these days. Like the pagan world that surrounded the Magi and the distracted world of old Jerusalem, so the world that surrounds us is blind to the far greater joy that God gives His people. How blessed we are to belong to Him at a time such as this! 1. Star: "Both the Hebrew (kôkāb) and the Greek (astēr) words for star were also used figuratively to represent any great brilliance or radiance. Very early in the Old Testament the Messiah is spoken of as a 'star [that] shall come forth from Jacob' (Num. 24:17), and at the end of the New Testament He refers to Himself as 'the bright morning star' (Rev. 22:16). It was surely the glory of God, blazing as if it were an extremely bright star -- visible only to the eyes for whom it was intended to be seen -- that appeared to the Magi in the east and later guided them to Bethlehem. It was a brilliant manifestation of “the sign of the Son of Man” (see Matt. 24:29–30; Rev. 1:7). The Shekinah glory of God stood over Bethlehem just as, centuries before, it had stood over the Tabernacle in the wilderness. And just as the pillar of cloud gave light to Israel but darkness to Egypt (Ex. 14:20), only the eyes of the Magi were opened to see God’s great light over Bethlehem. 3. Daniel: "After the Persian conquest of Babylon, Daniel held the office of the first of the 'three presidents' of the empire under the reign of Darius the Mede, and was thus practically at the head of state affairs, with the ability to influence the prospects of the captive Jews (Daniel 9), whom he had at last the happiness of seeing restored to their own land; although he did not return with them, but remained still in Babylon. As [Saul , who was renamed Paul after his conversion] journeyed he came near Damascus, and suddenly a light shone around him from heaven. Then he fell to the ground, and heard a voice saying to him, "Saul, Saul, why are you persecuting Me?" And he said, 'Who are You, Lord?" Then the Lord said, 'I am Jesus, whom you are persecuting...."
So he, trembling and astonished, said, 'Lord, what do You want me to do?"